HOUSTON, TX, March 30, 2010 /PRNewswire/ --- As a result of the generous support of its customers across the country, Jiffy Lube® proudly announces that its 2010 Maintenance Partners for Life campaign raised more than $1 million for the American Heart Association's (AHA) Go Red For Women® movement -- for a third year. More than 1,700 Jiffy Lube service centers participated in the campaign, which helps raise awareness and funds to fight heart disease. The campaign ran from February 1 through March 14 and raised a total of $1,111,784 nationally, surpassing the $1 million fundraising goal. All funds are allocated to AHA initiatives in the communities in which they were raised. The Jiffy Lube Maintenance Partners for Life campaign leverages the parallels between maintaining a healthy heart and a healthy vehicle. Nearly 2,300 Americans die of cardiovascular disease each day -- an average death of one every 38 seconds -- and 80 percent of the vehicles inspected during vehicle check-up events needed either service or parts, according to a survey from the Car Care Council in 2008. Maintaining a healthy heart and vehicle is a matter of choice and the right choices can help maintain the health of both. To learn about choices that can benefit heart health, visit www.GoRedForWomen.org and to learn about vehicle preventive maintenance, visit www.JiffyLubeGoesRed.com . Fans of the Maintenance Partners for Life campaign can also support the cause by joining the Jiffy Lube Maintenance Partners for Life Facebook Fan page at www.facebook.com/jiffylubempfl . To find a Jiffy Lube service center in your area, please visit http://Locations.JiffyLube.com . 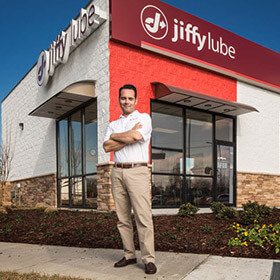 Visit JiffyLube.com to find oil change coupons and promotions, Jiffy Lube news articles, community involvement programs and events, franchise information and employment opportunities . _ Jiffy Lube International, Inc., America's largest fast-lube franchisor, and the American Heart Association are working together to fight heart disease. Through the Jiffy Lube Maintenance Partners for Life campaign, the goal is to raise more than $1 million dollars for the American Heart Association's Go Red For Women movement, which celebrates the energy, passion and power women have to band together and eradicate heart disease. To date, the Maintenance Partners for Life campaign has raised more than $2.3 million for the American Heart Association's Go Red For Women movement. Jiffy Lube International Inc. ("Jiffy Lube"), with more than 1,900 franchised service centers in North America, serves approximately 24 million customers each year. Jiffy Lube pioneered the fast oil change industry in 1979 by establishing the first drive-through service bay, providing customers with fast, professional service for their vehicles. Headquartered in Houston, Jiffy Lube is a wholly owned, indirect subsidiary of Shell Oil Company. Visit www.JiffyLube.com to learn more about Jiffy Lube and vehicle care.